The response to our Avian Aqua Miser Original closeout sale has been overwhelming. Mark's been busy building waterers ever since, and he expects to be entirely caught up by Wednesday. I didn't want him to get bored...so I slashed prices on the rest of our inventory. We're selling out of premade EZ Misers for the last time before our move --- $40 with free shipping. Meanwhile, we'll probably keep selling kits, but we're lowering prices there too in order to reduce inventory. 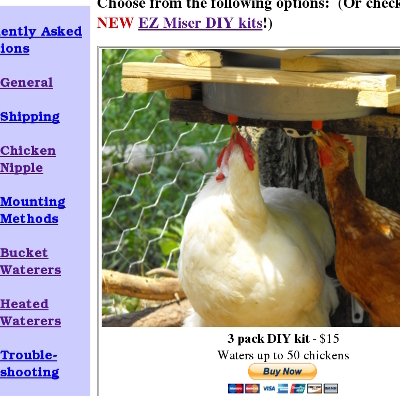 Avian Aqua Miser Original kits will now water your chickens for as little as 18 cents per bird while you can get a 2-pack EZ Miser kit for $25 with free shipping. Thanks in advance for giving Mark's POOP-free waterers a try and/or for telling a friend. We appreciate your support as we gear up for our move! drill size for chicken waterer? Mark just posted some more information about our hole saw kits here: http://www.waldeneffect.org/blog/EZ_Miser_hole_saw_kit_question/. It looks like you should be okay --- the mandrel is 1/4 inches in size.